Why Choose Us As Your Fragrance Designer And Supplier? Quite simply, our mission is to design, create and supply the world’s finest, high quality scents one fragrance at a time, all the while meeting every environmental and quality standard set by RIFM, IFRA, Oregon Tilth, ISSA and the NPA. Read on to learn more about our company’s rich history in the fragrance marketing industry, our credentialed team members as well as our dedication to both meeting our client’s needs and minimizing our carbon footprint, or contact our team today for any of your, your brand’s or your company’s needs. We are an internationally renowned fragrance manufacturing company who’s routes were born during the trying aftermath of World War II. Our focus, which has remained unchanged for the last seven decades, is to build great scents that build great brands. Located in Pittsburgh, Pennsylvania, we are known for our ability to transform the vision of any enterprise into an unforgettable olfactory communion between products and consumers that is certain to inspire brand loyalty. Our secret to enduring success is barely a mystery at all. We showcase contemporary brands and help to build consumer loyalty both with the creation of our vast array of uniquely blended scents and our unswerving business strategy, which is unilaterally focused on meeting the dynamic needs of the global perfume industry marketplace. Our fine, natural and organic fragrances have been and continue to be integral to an endless array personal care products, household cleaning products, private label brands, candles and diffusers, fragrances for home, fragrances for away from home, industrial air fresheners and designer customized perfumes. We also offer the world’s most diverse and effective vaporous odor-controlling additives. The powers-that-be behind the scenes at Alpha Aromatics are made up of the skills, dedication and acumen of our degreed perfumers, quality assurance executives and our compounding, production, sales and customer service team members, all of which are led by our master perfumer and Vice President, Roger Howell, President and CEO, Arnold Zlotnik and Chief Operating Officer, Bryan Zlotnik. As Vice President and Chief Perfumer of Alpha Aromatics, Roger Howell (featured above) is the creative force behind the expansion of scent development and manufacture of new creations and applications, and every day finds him in the lab tweaking formulas and testing fragrances. 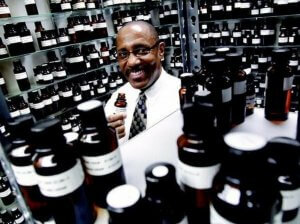 He trains our entire staff, including perfumers, lab technicians, sales staff, and customer service in perfumery. Roger, Tim George (Vice President of New Account Development) and our many other amazing team member’s efforts were recently featured in a local ABC news piece about the power of scent. Give it watch, or read on to learn more about our founders and what makes us one of the most favored scent designers in the industry. Roger’s story with Alpha Aromatics began almost forty years ago as a graduate chemist, when he entered the wrong building in search of a job. His quest mushroomed into a dynamic perfumery profession that has taken him all over the world. No ordinary perfumer, he wears many hats and has built from scratch several perfuming sectors; handling all aspects of scent composition, creativity and regulatory matters. His immense expertise has been profiled in industry magazines and he serves as a board member for the American Society of Perfumers and has been a members of both The World Perfumery Congress and the Organic Trade Association. Arnold Zlotnik is the founder, president and CEO of Alpha Aromatics, and he has had 40-plus years in the fragrance and air-care industry. He has dedicated his life to nurturing and developing Alpha Aromatics into the global leader it is within the modern perfume industry. Prior to forming Alpha Aromatics, Arnold was the original founder and largest shareholder of Aromatech (now Agilex), which he later sold. He has since built Alpha Aromatics into one of the leading perfume manufacturing and fragrance supplies companies and thanks to his creative passion and dedicated staff, the range of designer fragrance compositions Alpha produces now accommodate the demands of a myriad of diverse industries that include in addition to fine fragrance and skin care cosmetic applications, the production of scents for candles, diffusers, ambient scent branding products, fragrances for the home, vaporous odor neutralizing additives, private label brands, industrial air fresheners, household cleaning products and fine, customized perfumes. Bryan Zlotnik is a graduate of International Business from the prestigious Duquesne University in Pittsburgh, Pennsylvania and works directly with Roger and Arnold on all daily operations. He also travels the world in search of securing the highest quality essential oil producers, to provide Alpha’s many diverse clients with the purest, unadulterated oils. Bryan has adeptly transitioned Alpha Aromatics to meet the evolving demands and needs of today’s contemporary marketplace. Send us an inquiry or call to speak with our team today (412) 252-1012. The power of who you know cannot be underestimated in business and we are a well known bird-of-a-feather among the best of the best within the perfume industry. One of our most prestigious allies is The Natural Products Association also known as NPA. In continuous operation as an industry watchdog since 1936, this is the oldest, non-profit organization dedicated to the natural products industry. The Society of Cosmetic Chemists: Also known as (SCC), the Society of Cosmetic Chemists is New York-based research foundation dedicated to advancements in cosmetic science. The International Fragrance Association: IFRA represents global industry interests and promotes the safe use of fragrance. The International Sanitary Supply Association: Alfred Richter founded this international association of more than 9,000 companies in the professional cleaning industry in 1923. ISSA today is considered the global expert on cleaning and maintenance for all types of commerce and industry. Its many members include: distributors, manufacturers, manufacturer representatives, building service contractors, in-house cleaning professionals, residential cleaning professionals, and associated service firms. Research Institute For Fragrance Materials: RIFM is a nonprofit corporation that was founded in 1966. 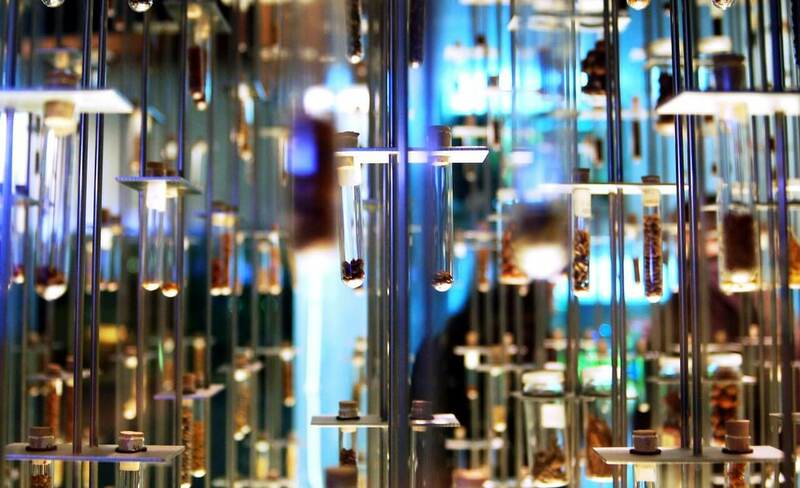 Its purpose down through decades remains unchanged; to gather and analyze scientific data, engage in testing and evaluation, distribute information, cooperate with official agencies, and to encourage uniform safety standards related to the use of fragrance ingredients. Women In Flavor and Fragrance: WFFC was founded in 1982 by women and for women working in the perfume industry. It provides networking opportunities, education and support systems. National Candle Association: Headquartered in Washington, DC and founded in 1974, this major trade association represents candle manufacturers and their suppliers situated throughout the United States. Their mission is to serve their more than 100 members by promoting safe products and a healthy industrial environment. This organization is recognized as the leading authority on candle manufacturing, science and safety. If you have any SDS and regulatory requests, please fill out our SDS request form, or call to speak with our sales representatives at (412) 252-1012, or internationally at (800) 295-5261. Why We Are The Perfume Industry’s Best? Our continued success within the perfume industry is no accident. We invest heavily in the most innovative scientific tools and the laboratories in our expansive 85,000-square-foot Pittsburgh Technology Center are equipped with state-of-the art innovations, such as gas chromatography, mass spectrometry, head-space analysis, distillation, extraction and quality control technology. Coupled with our need to always be the best we can, the approval of our clients determines our own level of satisfaction, whether large corporations or small enterprises. Our technologies are and always have been sustainable, and they reflect our love and respect for our planet. The legacy we are leaving for our grandchildren has always been a major concern for Alpha Aromatics, even long before it became fashionable and politically correct to think so. Having five degreed chemists on staff and two in quality control, we are bound by our strict ethics and regulatory standards. 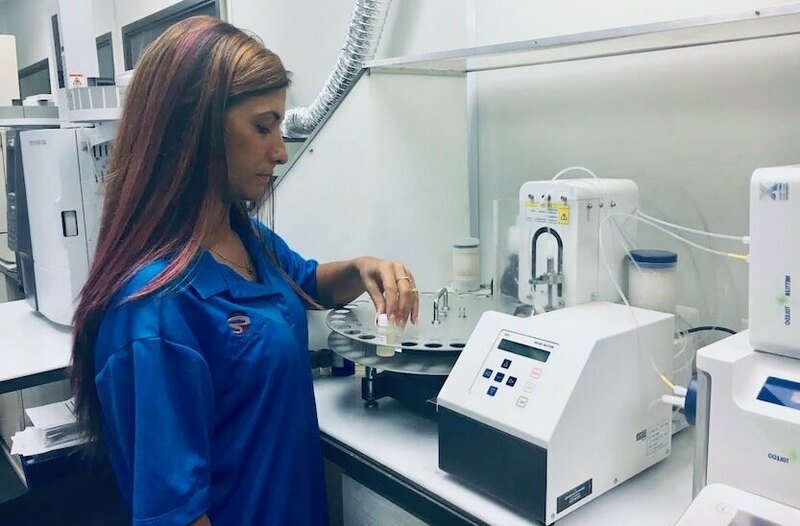 All of our products are fully tested before shipment and our safety regulatory staff control the disposal of all chemicals and chemical containers. Any containers disposed of are completely cleaned and labels removed before recycling. With Roger Howell at the helm, our team of talented chemists regard the creation of any scent as a highly sophisticated and customized art form requiring meticulous detail and complexity. In order for scent branding to be effective, the chosen fragrance must mirror the message the company wishes to convey to its client base. The development of a “scent identity” is achieved via innovations in the field of industrial science and the ever- present hand of technology. Scent branding on the surface may seem to be as natural and easy as placing a moth before a flame, but enticements and allures to specific scents and their seepage into consumer perception and behavior is not natural and requires consummate skill in order to appear so. It is the quintessence of gentle subliminal indoctrination, promoting both brand acceptance and loyalty. It is a skill based on scientific knowledge, as we at Alpha Aromatics know very well that 75% of all human emotion is triggered by smell. Our clients are as diverse as America’s many populations and cultures and they represent a myriad of industries. These include but are not limited to: perfumery brand managers and owners, private labels, cosmetic scientists, soap makers, product development scientists, skin care formulation chemists, packaging technologists, candle reed diffuser manufacturers and the aspiring entrepreneur looking to launch their own perfume. Via our scent marketing division, Air-Scent International, our uniquely designed scents can be found wafting through hotels; salons and spas; gyms and fitness centers; casinos; conference centers; schools and universities; showrooms; hospitals; banks, funeral homes, retail environments and a endless array of other commercial interiors. Our clients, which are some of the most prestigious in the world, come to us to create that elusive, one-of-a-kind fragrance that will whisper their specific message in a language more compelling than words. So send us a message or call our team today and discover the olfactory magic we can create for your company and that all-important bottom line.